ABB has announced the acquisition of B&R, supplier of machine and factory automation devices and systems. B&R is a CiA member providing CANopen support. B&R, founded in 1979 by Erwin Bernecker and Josef Rainer is headquartered in Eggelsberg, Austria, employs more than 3 000 people, including about 1 000 R&D and application engineers. The company operates across 70 countries, generating sales of more than US-$ 600 million (2015/16) in the US-$ 20 billion machine and factory automation market segment. B&R's CANopen-based products and solutions for machine and factory automation will be combined with ABB’s offering in robotics, process automation, digitalization, and electrification. B&R also uses CANopen-based application layer and device profiles in its Ethernet-based Powerlink communication system. Several ABB divisions also implemented CANopen in several product lines. Some of them are also members of the nonprofit CiA organization. With the acquisition, ABB will expand its industrial automation offering by integrating B&R's products in PLC, Industrial PCs, and servo motion as well as its software and solution suite. A range of these products are CAN-based. B&R has grown with a revenue CAGR of 11 percent over the last two decades. Revenues more than quintupled since 2000 to more than US-$ 600 million (2015/16). Both companies have complementary portfolios. ABB is a provider of solutions serving customers in utilities, industry, and transport and infrastructure. B&R is a solution provider in the automation of machines and factories for industries such as plastics, packaging, food, and beverage. ABB will continue B&R's solution-based business model and build on its domain expertise to develop new software-based services and solutions for end-to-end digitalization. On closing of the transaction, B&R will become part of ABB’s Industrial Automation division as a new global business unit – Machine & Factory Automation – headed by the current Managing Director, Hans Wimmer during the integration phase to ensure continuity. The integration will be growth-focused and live by the “best-of-both-worlds” principle, with ABB adding its own PLC and servo drive activities to the offering of the new business unit in a phased approach. ABB underlines its clear commitment to continuing the B&R growth story by articulating a mid-term sales ambition to exceed US-$ 1 billion. B&R's headquarters in Eggelsberg will become ABB’s global center for machine and factory automation. With this acquisition, ABB becomes the largest industrial automation player in Austria. ABB has operated in Austria for more than 100 years. The transaction multiple is in line with peer valuations. The parties agreed not to disclose the purchase price. 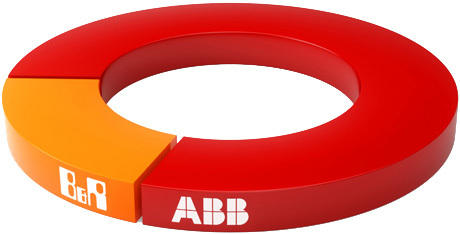 ABB will finance the acquisition in cash. The transaction is expected to be operationally EPS accretive in the first year, and is expected to add synergies of about 8 percent of B&R's stand-alone revenue in year four. The transaction is expected to close in summer 2017, subject to customary regulatory clearances.